European Elk - Moose Hunting - Are you Ready? Preparation is the key to Moose Hunting Success. I hate to have to repeat one of life?s most valuable lessons; ?Be prepared?. Wow... how many times have we all heard that? You have likely been told that by people of influence throughout your entire life. However, it is one of those lessons that we all need to be reminded of from time to time. For me, this year?s Moose hunting in Canada was no exception. I was ready. My wife says I am preoccupied with Moose; I have no idea why she thinks that way. Just because I start planning next year?s hunt the day after I return from the current years hunt? She accuses me of seizing every opportunity to steer a conversation towards Moose hunting! Our travel trailer has a Moose theme, and I am teaching my grandson, who by the way is only two, to love and respect Moose. For Moose hunting success, timing and circumstance mean everything; usually, you have no control over it. Close to sunset... I decided to check one more meadow before returning to camp. After a short ride on my ATV, I arrived at an access point to the meadow. It is actually a beautiful area, the air ? fresh with the smell of pine and the soothing sounds of water trickling over the beaver dam, perfect habitat for Moose hunting. Checking my watch I see I only have about 30 minutes of shooting light left. Not wanting to waste any time, I picked up my Birch Bark Moose Call and gave a Cow Moose Call. ?Ugh, Ugh? Instantly there was a response! A Bull Moose answers and he is close by! I am not ready! Adrenalin rushes through me like a train overpowering its load. S#%t... I cannot believe my ears, another vehicle from the opposite direction. The second vehicle passes. Again, no shots fired. I wonder if the Bull is still nearby? Moose are unmistakable when you see them in the open but it takes a moment for me to realize there are actually two cows standing on the bank. I immediately start to brake while at the same time I reach for my bow. The cows do not stick around and in a flash are off the bank and out of sight, leaving, much to my surprise, my Bull Moose standing alone on the hillside. The next few seconds are a blur, but I can imagine how the event unfolded. ?Thwack? the distinctive sound of an arrow hitting home. My Bull runs out of sight. I met up with my partners and explained the situation. I tell them I feel good about the shot, I just wish I could have seen where it hit, for no other reason than to boost my confidence. It really did not take that long to track the Moose, with more eyes to spot the blood trail, we found my Moose about 70 meters from where I shot at him. Quite dead! A Moose hunting success! In the end... I was ready. 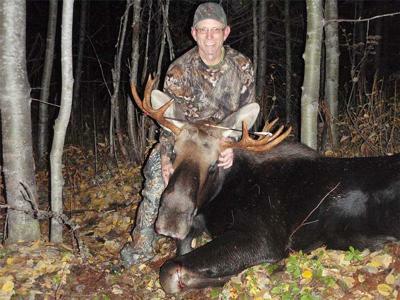 Comments for European Elk - Moose Hunting - Are you Ready? It was fun, and I look forward to hunting Moose with my bow again next year. I was fortunate enough to see two bulls this year but was unable to get close enough to the other. That sounds so like fun!!! I've never even seen a moose - yet my home has pretty much of an elk & moose theme. Went back to Maine several years ago...saw "Moose Crossing" signs about every 1/4 mile...heard of milk tank trucks hitting them...I was there 10 days & never saw a single one!! :-( I'm still bummed out about it!! Congratulations! And best wishes for another one next time around.